Oakland Park Florida is just three miles north of Fort Lauderdale. Oakland Park has a total area of only 6.9 miles and was originally named Floranada. 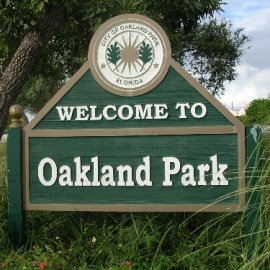 Residents changed the name to Oakland Park after the hurricane of 1926 put the town into bankruptcy. Being so close to Fort Lauderdale, Oakland Park is a great place to visit, as it has many unique attractions. One unique event to take part in when visiting Oakland Park is the Fort Lauderdale Ghost Tours. Here visitors are led on a tour by lantern light along the New River's banks, to get a glimpse of the mystery, hauntings and the history of Fort Lauderdale. This is a walking tour that takes about two hours to cover seven city blocks. Another unique and interesting attraction in Oakland Park is the Jungle Queen Riverboat Cruise. This three hour boat tour runs through the waterways of the New River and has a stop at the Jungle Queen Indian Village. The village is a tropical island where visitors can see rare birds and plants, as well as alligators. Also on the island people will learn about the history of the Florida Seminole Indian tribe. Oakland Park has a lot to offer to people who visit. Enjoy the tropical sunny weather in this Florida town. Kat Divine and I will be back at the Center For Inner Wisdom for another fun Gallery event, an EVENING OF MEDIUMSHIP. Friday, May 3rd at 7pm. Sunday May 5th Cinco De Breaks Yo!